Declaring that India is witnessing feminization of agriculture Union Minister Radha Mohan Singh said the govt aims to reserve at least 30% of the budget allocation for women labours and farmers. The govt wish to connect them to micro-credit through capacity building activities and to provide information and ensuring their representation in different decision-making bodies, Minister said. 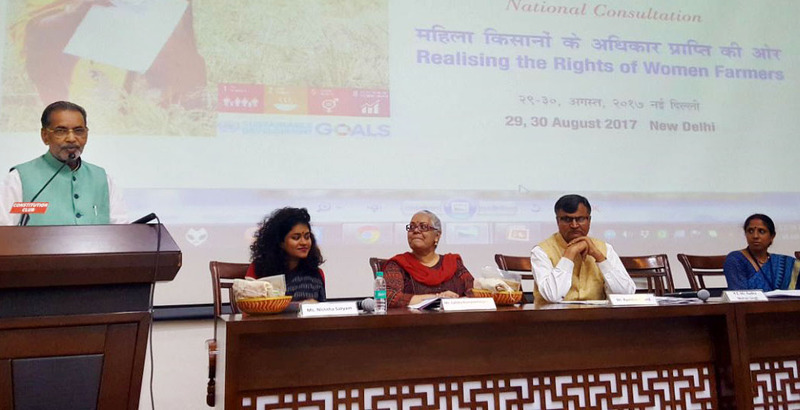 He was participating in at the “Securing Rights of Women Farmers: Developing a Roadmap for Action” event, organized at the Constitution Club, New Delhi, by the National Women Commission in association with UN Women and Mahila Kisan Adhikaar Manch (MAKAAM). Singh said according to NSSO (National Sample Survey Office) survey, a decline in both male and female labour force in agriculture has been observed in the last three decades. The number of men in agriculture has decreased from 81 percent to 63 percent, and women from 88 percent to 79 percent. This so because deterioration in the number of women is significantly lower than the men and this can be easily called the feminization of agriculture. Union Agriculture Minister said that rural women’s contribution to the economy of the majority of the developing nations including India is vital. 80% financially independent women are engaged in farm-related activities in India, he underlined. Out of them, 33% are working as agricultural labourers and 48% are self-employed farmers. According to as per NSSO report, women lead almost 18% agricultural households and there is not a single area of agriculture in which they are not involved, he added. It bears recall that last year, the Ministry of Agriculture and Farmers Welfare decided to celebrate 15th October of every year as Women Farmer’s Day.